Dr. Ronald Baker purchased his first real camera (an SLR) over 35 years ago and came by photography naturally, being born into a family that started taking pictures and making glass prints in the late 1800’s. Now retired after working 34 years at three California community colleges, Dr. Baker served his last position as Dean of Educational Programs for Santa Barbara City College. In July, 2006, he traded in his desk for a new DSLR camera. A Nikon enthusiast, he currently uses an F-100, D-300 & D-700 and a quiver of f2.8 lenses, plus a film Contax T-3. Being comfortable with computer technology has enabled him to experiment and explore at ease new camera technology and image management software. He is not afraid to utilize the ever new features of printers, lenses and cameras themselves. He has a fine eye for lighting—in particular he is drawn to working with low-light photography and HDR processing. His photographs are not only artistic, but warm and remarkably personal. Known as a photographer who ‘truly enjoys his work and always strives for perfection,’ Ron has an easy-going personality, which makes him a pleasure to work with. Ron’s photo interests are diverse. 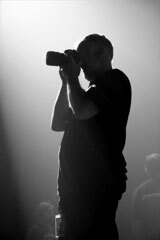 Recognized for his concert photographs, he also enjoys shooting flowers, lifestyles, landscapes and natural subjects for both commercial and personal rewards.